Sarlat - Now we're talking! The most famous town in the region and one of the most renowned and visited in France. It is also one of the most attractive. Often called just Sarlat, the town is actually twinned with its less famous neighbour and is more correctly called Sarlat le Caneda. 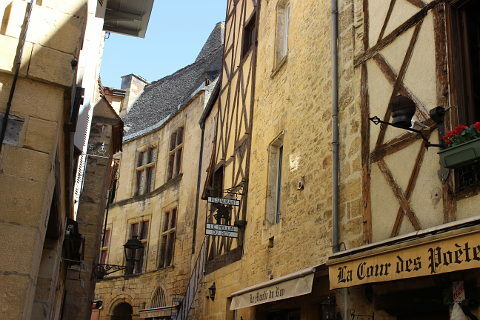 Sarlat is in the region called the Perigord Noir in the Sout West of France. 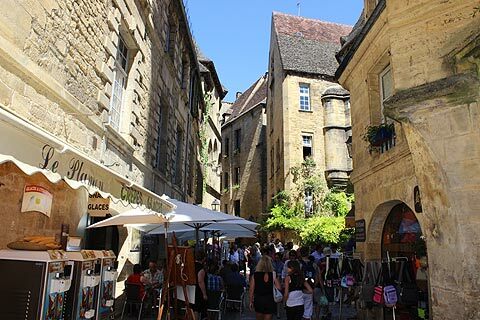 Destined to be besieged by tourists at almost all times of the year Sarlat is a beautiful, well restored town a few kilometres north of the River Dordogne. The old town, dating from both medieval and renaissance times is a pleasure to visit, especially during the spring and autumn, or early in the morning. If you can catch the early morning sunshine on the yellow sandstone buildings, so much the better. 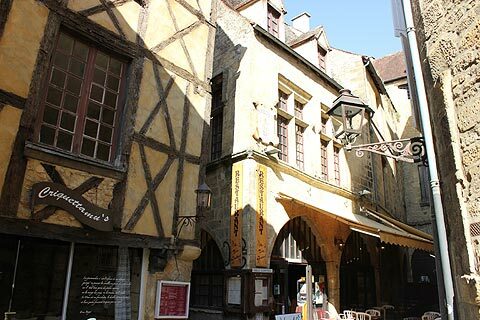 Before setting off for your walk around Sarlat, visit the tourist office which can provide a suggested walking tour to take in the key attractions. The tourist information office is near to the cathedral. 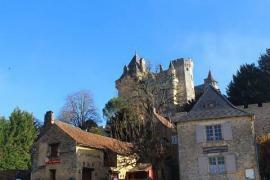 After your visit there is lots to see in the area around Sarlat. 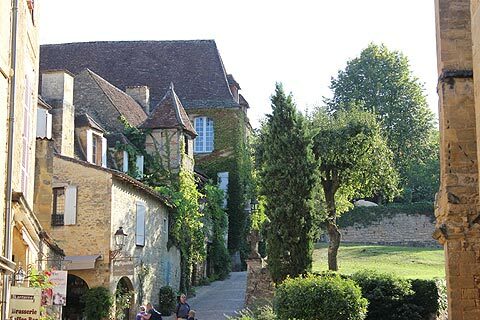 Take a look at our 1-day guide for the key things to do around Sarlat. Broadly, the pedestrianised Rue de la Republique runs the length of the old town, with mazes of narrow streets either side. The cathedral is to the south-east of Sarlat, with the attractive Place de Payrou and Hotel de la Boétie. North east is the lovely Place de la Liberté and the wonderful winding street of the Rue des Consuls. The cathedral was originally the church of Sarlat Abbey. Over the centuries it has been added to and transformed and is now a mix of Roman, Gothic and other styles. The cour du cloitre and the nearby cour des fontaines and the cour des chanoines were all originally part of the abbey. The jardin des Enfeus just above the cathedral is the ancient abbey cemetary and there are several sarcophagus and 'enfeus'(enfeus are tombs that are built into the church wall). Up above the cathedral and the Jardin des Enfeus is an unusual structure -' La Lanterne des morts', lantern of the dead. This bullet shaped building has had various roles over time including a funeral chapel. Opposite the cathedral on the Place du Peyrou is the splendid 'Hôtel de La Boétie', birthplace of the philosopher and humanist Etienne de La Boétie. His house has a large arched entrance and Renaissance style mullioned windows. Crossing the Rue de la Republique to the west side of town take a look at the Hotel St Clar with its wonderful turret tower and see the Tour du Bourreau and the last remaining part of the ramparts. Wander northwards past the convent of Ste Claire and the Chapel of the Penitents Blancs with its huge Baroque doorway. Crossing back over the Rue de la Republique walk down the Rue des Consuls. 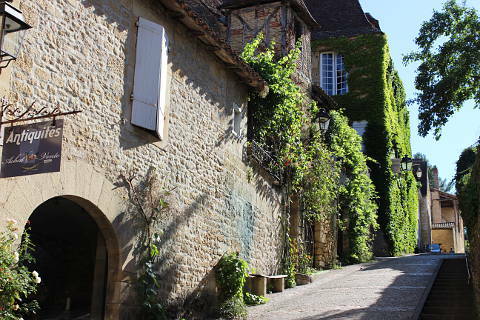 This road is one of the highlights of Sarlat and contains a number of very impressive mansions. There is the 16th century Hotel de Mirandol with its imposing doorway, the 14th century Hotel Plamon with its three arched windows. The floor above with its mullion windows was added a century later. The Hotel de Vassal was built in the 15th century and has a double turret and the Hotel Tapinois de Betou has a monumental staircase. Wandering along the street taking in all the different details of windows and doors and roofs is a pleasure. About half way along the Rue des Consuls is the Manoir de Gisson originally called the Hotel Magenat. The Manoir de Gisson is made up of two buildings of different styles linked together by a hexagonal tower. The building dates back to the 13th century. Recently opened to the public there are two aspects to your visit. The first is a visit to the vaulted cellars and rooms which exhibit items on the history of Justice from the Middle Ages to the Revolution. This includes an exhibition of instruments of torture. 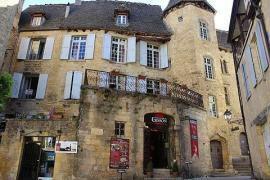 The second part of a visit to the Manoir de Gisson is the private apartments showing home life for the Sarlat nobility. Furniture dates from the Middle Ages to the 17th century and you can see the lovely wooden floors, panelling and huge fireplaces and of course the spiral staircase which winds up the hexagonal tower. Outside the Manoir de Gisson is the Place du Marché des Oies, the goose market with a statue of some geese in the centre. A little further on, back towards the cathedral is the fabulous main square, the Place de la Liberté. This lovely square is paved and pedestrianised and surrounded by wonderfull buildings and has a view towards the bell tower of the cathedral. Many of the buildings are home to restaurants making this an excellent spot to stop for a drink or a meal. The town hall with its circular bell tower perched on its roof is also on the square. Finally on the edge of the old town visit 'Le Présidial'. This attractive 17th century building has an original lantern structure on its roof and was the headquarters of the royal court in the 17th century. It is now a well known gastronomic restaurant. Frequently you will think yourself lost in the winding medieval streets - don't worry, it's essentially a small town, and sooner or later you will emerge into the light and refind your path! 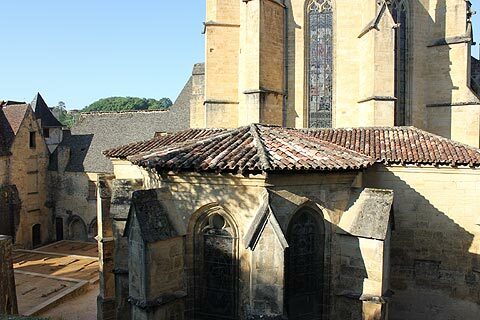 Don't forget to glance up from time to time as you explore the medieval cobbled streets - the rooves of the buildings in medieval Sarlat are often in 'lauze' - carefully cut stone - and are unusual elsewhere. 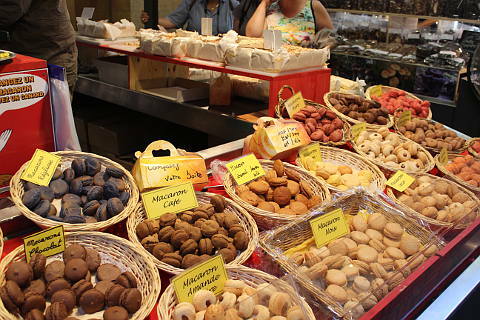 Market day in Sarlat is Saturday and Wednesday. Sarlat has a Christmas fair in December with around 40 wooden chalets selling arts and crafts and there is also an outdoor ice-rink. 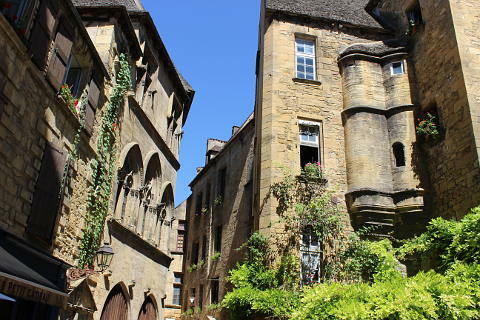 Sarlat's traceable past began in the 9th century with the founding of a Benedictine abbey. The abbey grew and acquired other churches in the Perigord region and with its growth a town began to build up around it. The town was under the authority of the church but as the abbey grew in power, tensions also grew and finally in 1299 the town was granted liberty from the church by Philippe le Bel. 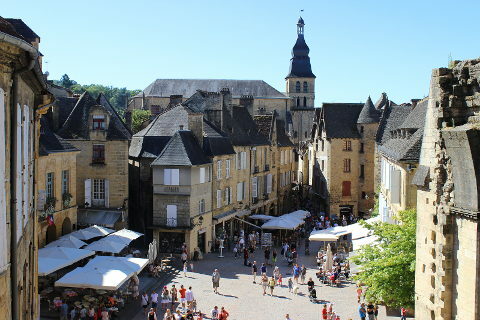 In medieval times Sarlat grew bigger and richer and became an important market town. 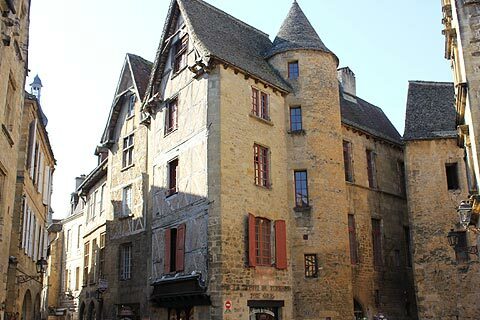 Many of the fabulous houses in Sarlat's old time were built during this time to house the rich merchants. Despite its fortified walls Sarlat suffered greatly during the Hundred Years War. 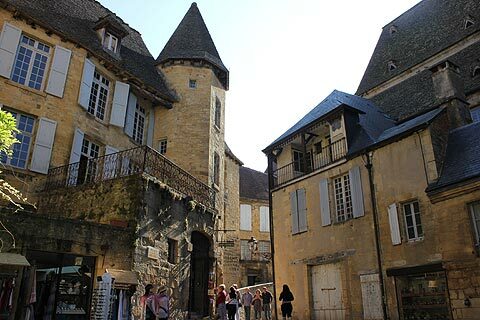 The end of the 15th century and beginning of the 16th century was again an important time for Sarlat. With an exemption of some taxes the town began to prosper again and became an important political and judicial centre. Another period of building started this time in the Renaissance style. The Italian Renaissance ideas were to influence one of Sarlat's residents and Etienne de La Boetie became a famous humanist and philosopher. The house of his birth still stands opposite the cathedral. The Wars of Religion struck and Sarlat at the end of the wars was firmly catholic. In the following centuries the bishops played an important part and the cathedral was completed and the bishop's palace restored. The fortifications were removed (only a very small section of ramparts still exists) and the defensive ditches filled in. Following the Revolution in 1789 Sarlat lost its bishopric but the last bishop became the first maire of Sarlat and Sarlat began its new role as a centre of commerce but its distance from main road routes and lack of railway for many years meant that it did not become a successful commercial centre - happily for us as this could have lead to the destruction of many of its historic buildings in the name of progress! In 1962 Sarlat became the trial town of a new law called the 'loi Malraux' which set about to protect the patrimony of French towns. 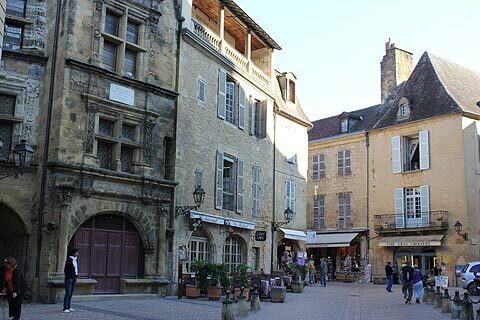 Money was provided to restore Sarlat's fine buildings and it now has the highest density of 'Historic Monuments' and 'Classified Monuments' of any town in France. It is now classified as a 'Town of Art and History' and as a 'Plus Beaux Detour' - a town meriting a visit for its beauty. The historic centre is also on the tentative list for UNESCO World Heritage Classification. One of France's top architects, Jean Nouvel, was born in Sarlat. The Pritzker Architecture Prize winner 2008 has recently restaured the church of Sainte-Marie in the centre of Sarlat. Mixing contemporary elements with the 14th century architecture of the church the interior has now been converted into an elegant covered market. The highlight though is the panoramic lift which rises up through the centre of the bell tower and raises its passengers up above the top of the tower to get breathtaking views of the town. Inside a glass cube you can get 360° views over the rooftops of Sarlat - wonderful. In summer (15 June to 15 September) the lift is open from 9am to 9pm and costs 5 euros. 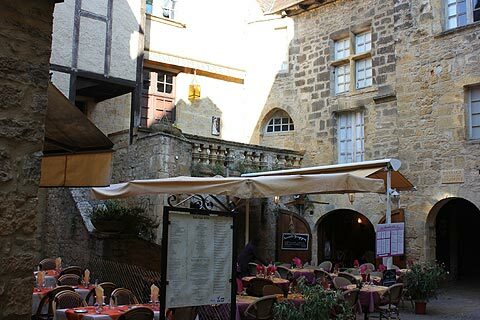 Sarlat is a gastronomic centre, the region being well known particularly for foie gras and truffles. Plenty of shops offer the chance to stock up on these and often offer tasting sessions too. Be sure to look in the indoor market too. The displays are wonderful. The third weekend of January Sarlat celebrates the Fete de la Truffe and the third Sunday of February is Sarlat's goose festival - Sarlat Fest'oie. 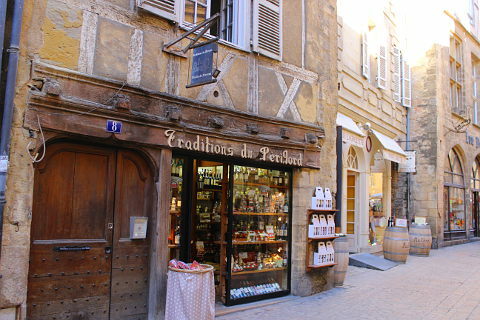 There are some fantastic nougat shops in Sarlat - be sure to try it. Its nothing like the chewy plastic wrapped stuff you get at home. La Roque Gageac is not only one of France's "most beautiful villages" with its cluster of stone houses huddled beneath the looming rock-face, it is also worth visiting for the exotic planting which fills the village. Also its pretty riverside position means that you can hire a canoe here or set out on a river trip on one of the Gabarres, a river boat fashioned on the old river trading boats. 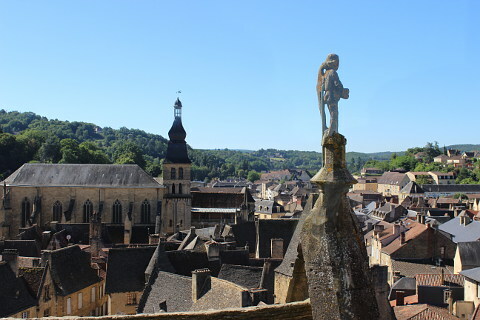 Sarlat is not only beautiful but it is in the heart of the Dordogne and surrounded by fabulous places to visit. 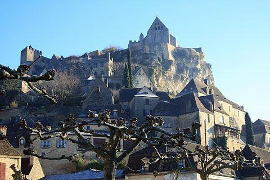 The "most beautiful villages of La Roque Gageac, Domme and Beynac are all close by. 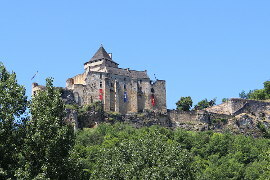 The Chateaud de Castelnaud with its reproductions of medieval weapons and the imposing Chateau de Beynac are both within 10km. Garden lovers will like the lovely garden at the Clos des Sources at Vitrac with its border of grasses and borders that are quite like an English border in style. 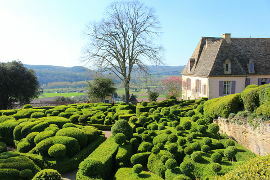 As a contrast visit the gardens of Marqueyssac with their incredible swirling box hedges and incredible views over the Dordogne river. 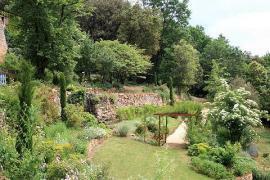 Also nearby are the much more formal but equally impressive Jardins d'Eyrignac. Also not far away are the huge selection of caves around Les Eyzies where you can choose to explore caves with magnificent stalactite displays or prehistoric paintings, sometimes both in the same cave. The Font de Gaume cave is one of the last caves still open containing prehistoric polychrome paintings (others such as the Lascaux caves are copies though the copy is fantastically done and definitely still worth visiting). If you are looking for a hotel in or around Sarlat then our hotels search at the top of the page will find you the best hotels at the best prices in the Sarlat area. Alteranatively camping in the dordogne can be a great option, especially if you are traveling with children. 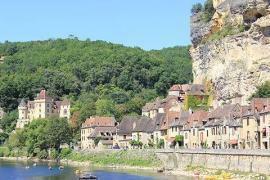 See Camping Sarlat for a great campsite near Sarlat. La Palombiere has pools, a tennis court, crazy golf and nice shady sites. 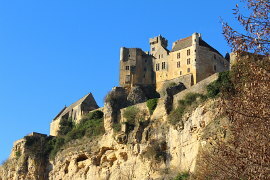 It is just 8km from Sarlat.